Uses a rocket as a stepping stone. Takes out seven guys with no difficulty. Last edited by ZomBninjasamurai on Thu Feb 09, 2012 9:48 am, edited 7 times in total. If i had to ask, Major, isn' t it stated that on the High-end, Snake is at least Low-Superhuman, given he's supposed to be some sort of Super-Soldier? 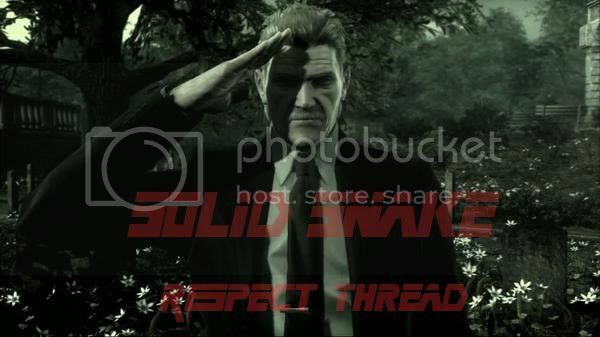 Commander Cross wrote: If i had to ask, Major, isn' t it stated that on the High-end, Snake is at least Low-Superhuman, given he's supposed to be some sort of Super-Soldier? He'd only be low-superhuman due to his reflexes, aside from that I'd say hes peak human. Any Movement Speed feats you recall? Snake dodges a bullet from Olga's knife. Microwave hallways can't stop a real man. Are the Infinity Bandana and Stealth items canon? Asger wrote: Are the Infinity Bandana and Stealth items canon? Possibly an example of superhuman senses? I mean the guy was fast asleep and snapped awake as soon as Raiden made a move. Unless he's just really good at playing possum. sorry for a bad video. 1:54, jumps pretty high and does a pretty good kick. Thought it might be useful when it comes to dodging, or combat in mid-air. Is the infinite ammo bandana still present in C.I. though? I don't remember Snake having infinite ammo in Guns of the Patriots.